Citrus, green, very fresh and floral. Gardenia, obviously, is the impression I’m supposed to take away from this. A fresh, crisp, dewy gardenia fragrance that I’m tempted to pinpoint as a soliflore. There’s other florals in here, of course, to deepen the fragrance and take it beyond just plain old gardenia. Jasmine, ever the staple, is present as is lily of the valley. All this coming together to support the gardenia and really make it bloom. In Bottle: Sharp and crisp citrus notes right up top. They sort of mask the gardenia and the rest of the florals as they hog up most of the olfactory real estate. Very interesting for a fragrance that focuses on gardenia. There’s sweetness in there too, and I get the distinct impression of dewiness. Applied: See you later, citrus. The florals bloom immediately on my skin as the citrus notes fly away after leaving their initial almost disinfectant impression on my skin. It’s as if they came out first to scour the canvas before the florals get there. I smell dewy, flower petals. I smell gardenia and jasmine slowly unfolding in a light green, freshly misted bouquet. Gardenia Petale is extremely soft and very airy. The dry down becomes quite interesting as the gardenia is joined by something equally green and just a bit mossy. There’s also something lightly musky about this too as the dry down starts to deepen and the florals lose a little bit of their bloom, letting in smoother mossy notes. Extra: Van Cleef & Arpels is a jewelry, watch and perfume company founded in 1896. The collection Gardenia Petale is a part of is called the Collection Extraordinaire. 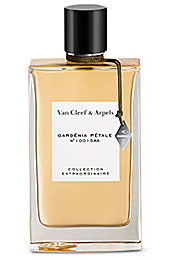 Design: Gardenia Petale, like the rest of the Van Cleef & Arpels collection is bottled very simply in a rectangular glass vessel with a black cap. There’s a little charm thing dangling from the neck which gives the bottle a bit of added flavor. Otherwise it’s very standard and, honestly, standard looks work when they are done right. This bottle design did it right. Notes: Citrus, lily of the valley, gardenia, jasmine, musk. I often find myself judging soliflores a bit harshly. This is because I really expect them to not only illustrate the experience of what it must be like to smell this flower but to see it and feel it too. Gardenia Petale is a wonderful fragrance that’s really good at all these things, particularly in the seeing sense as I can smell the greenness of the leaves but never lose the sense of white petals. Reviewed in This Post: Gardenia Petale, 2009, Sample vial. This entry was posted in Reviews By House, soliflore, van cleef and arpels and tagged arpels, cleef, fragrance, gardenia, jasmine, scent, soliflore, van. Bookmark the permalink.